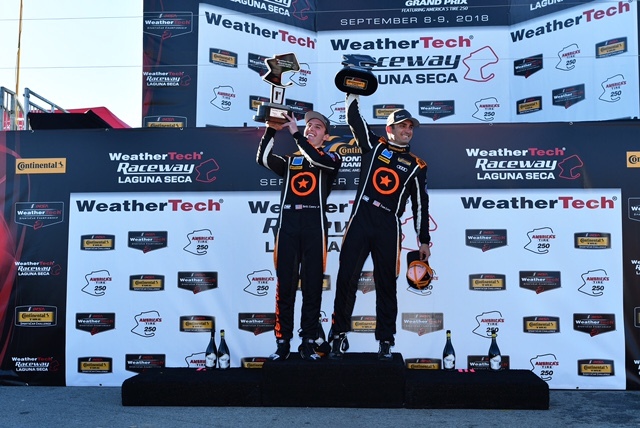 Retaking the Points Lead after a Win in Monterey! What a week in Monterey! 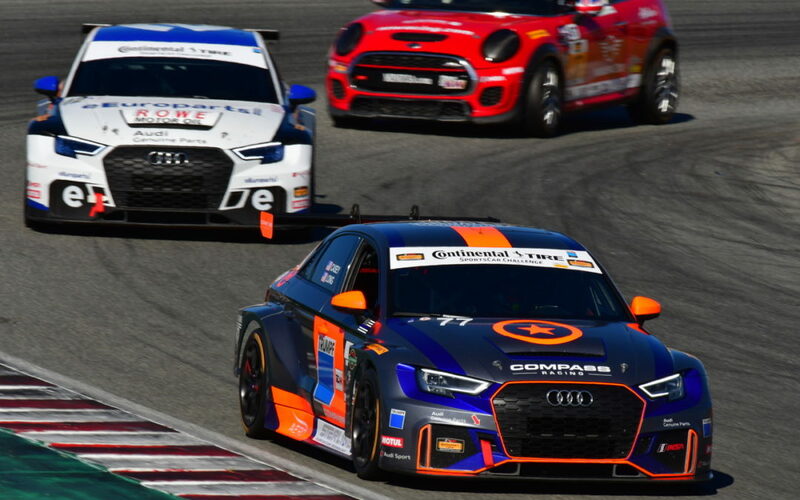 Not only did Britt Casey, Jr. and I win the TCR class in Saturday’s IMSA Continental Tire race, but we have retaken the points lead in our No. 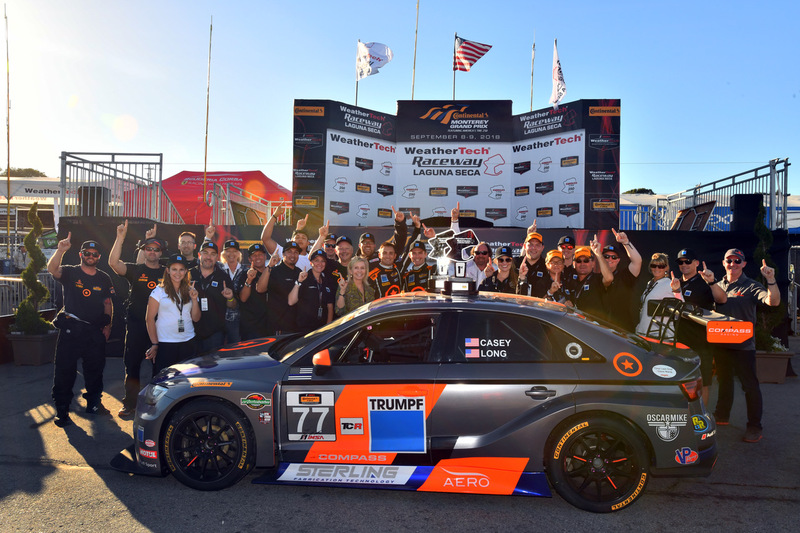 77 TRUMPF Audi RS3 LMS with just one race left to go! 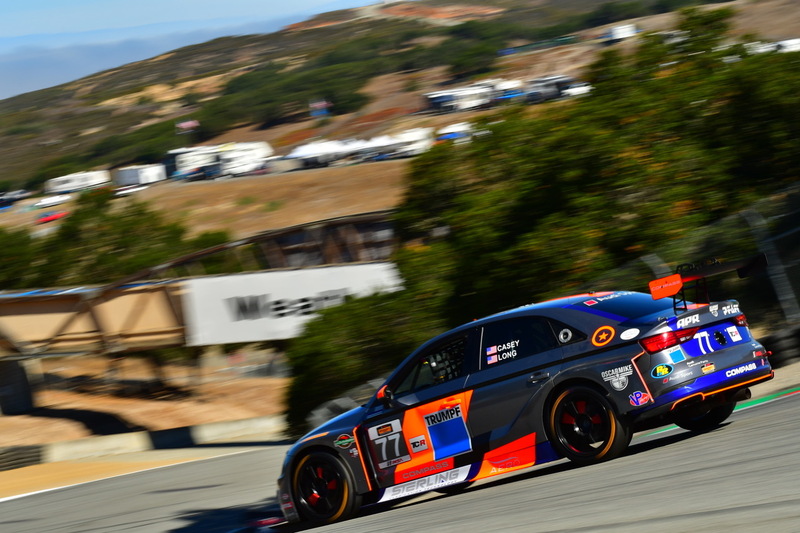 I was fortunate enough to visit WeatherTech Raceway Laguna Seca recently for the Motorsports Reunion, but the track felt a lot different last weekend with all of the IMSA teams there and the intensifying championship battles. In practice, it was very apparent that finding the optimal setup for grip due to Laguna Seca’s sandy nature was going to be paramount. I think every team felt, at least once during the weekend, that they weren’t sure if they had found the right balance because new tires played such a large role in the pace. If you were on new tires, you felt like a hero. If you were on old tires, you felt like you should scrap everything and start over. After a roller-coaster of emotion and setup strategy, we were able to find a happy balance heading into qualifying. Britt did another phenomenal job keeping our streak alive of qualifying on the front row for every race so far this season. On race day, we had our fingers crossed that what we had “invested in” with our setup was going to pay off. As the race unfolded, Britt took off to a comfortable lead. As the first and only caution flew, we did our full-service pit stop with driver change. I had a really good race with our teammate Kuno Wittmer, who we’re battling against for the TCR championship. It was fun to race with him at the start of my stint, but I also knew the tires needed to last so I couldn’t do anything silly with them. Because the yellow fell right at the minimum drive-time point, I think all teams felt that there would be at least one more yellow flag to get them to the end, saving not only fuel but also tire life. Somehow this was not the case and the course stayed green for the rest of the race, so it became a tire-life race to the end. Throughout my stint, I had the familiar feeling of always second-guessing myself: was I saving enough fuel, and was I saving enough tires for the end of the race? At least with fuel, you can monitor how much you’re using with every lap, but with tires it’s a different story. It’s a lot like my experience running a half-marathon: you hope you don’t go out of the gate too fast and by the seventh mile feel so winded that there’s no way you’re going to be able to do the last six! As the pace started to fall off, we found ourselves in a very comfortable position, continuing to lead the race and managing the gap all the way to the end. Looking back, I don’t know how we did it, but we managed to make it without the tires getting too worn, unlike other cars. It truly goes back to not just the driving, but the great setup direction that we went in as a team. Now, it’s on to Road Atlanta for the finale, and we’ll see what fate has in store for us!